Whitesnake's performance at the 1990 Monsters of Rock at Castle Donington has been the most requested project by fans since the inception of whitesnake.com. The performance is legendary: their second co-headlining appearance at Donington riding the rails of the Liquor & Poker World Tour supporting Slip of the Tongue. Coverdale would fold the band after the tour, with the next significant resurrection in 2007 for Whitesnake's 25th anniversary. Frontiers is offering both a CD and DVD package, the latter with extra material including making Slip of the Tongue. 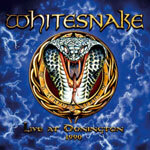 Live at Donington is characteristic Coverdale/Whitesnake in their prime (perhaps only to be seconded by the current version). The line up with Coverdale is familiar: legends Steve Vai and Adrian Vandenberg on guitars, venerable Rudy Sarzo on bass, and the always formidable Tommy Aldridge on drums. Even after twenty years, not much has changed. Coverdale revels as bandleader and cheerleader with his signature 'Here's a song for ya' and loud potty mouth encouragement to the crowd. For song favorites, they abound. The hits are here: Crying in the Rain, Is This Love, Here I Go Again, and Still of the Night, to name several, but also the classics like Ain�t No Love In The Heart Of The City and Judgment Day. All these still make the set list today. Others sometimes not: Slip of the Tongue or Cheap N Nasty. Coverdale, of course, is old school and offers individual performances of guitar and drum solos. Frontiers Records (with Coverdale, I would assume) have made every effort to get the best out of this archival recording. It sounds good, but can be muffled sometimes or scratchy as on Crying in the Rain. Nevertheless, for a remarkable period piece from one the greatest rock bands, this is prime stuff. I can't wait to see the DVD. I'm sure my first reaction is going to be, 'Cripes, they look young!' (Coverdale was a young 37 years old!) Recommended as a great live album. Here's classic Whitesnake/Coverdale at the end of first major run: live at the Monsters of Rock, Castle Donington, in 1990. A solid line up gives a energetic and entertaining performance. It's not to be missed.